For April, we revisit the public information film from 1968 that introduced us to dialling 999 for the coastguard. 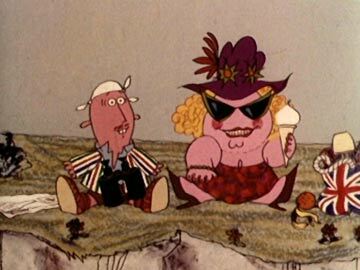 Holidaymakers Joe & Petunia are	picnicking on a cliff when they eventually realise they are watching a sailor in distress and make the call to rescue him. It	sounds serious, but the message is put across in a short, 90-second comedy masterpiece! The film was	modernised and re-released in 2006 to coincide with the 60th anniversary of the Central Office of Information, which commissioned the original. Joe's knotted hankie was gone from his head and he now made the	call from his mobile rather than rushing to a phone box. But Petunia	still licks her ice-cream like a noisy lizard. Last year, 50 years after the film was made, clips were featured in a brand new public information film from the Maritime and Coastguard Agency, who had found that half the population still didn't know that they should call 999 in a coastal emergency. The story of the disappearance of Central and Westcountry, swept away by the Carlton branding machine. The story of the disappearance of LWT, HTV and the regional announcers, despite assurances from the Government that ITV's regional identities were safe in their hands. The story of how Carlton and Grampian disappeared along with hours of regional programming. A FAQ on digital TV from 1999 when it was a new thing! A time when you could plug a set-top box into your TV and get Sky One on subscription with no dish, no cable or internet required. From 2003, the annoyance of colourful, sometimes animated, permanent on-screen logos or "DOGs" that most channels have nowadays. TV Station logos from yesteryear, featuring Dave Jeffery's Flash Files and Flash-free symbols, clocks and break bumpers. Plus a look back to November 2004, when ITV3 launched, prompting a rebrand for the ITV family of channels. Transcripts of public information films with some available to watch (if you have RealPlayer, VLC or something similar and can put up with the tiny video size, but at least the links should all be working now!). 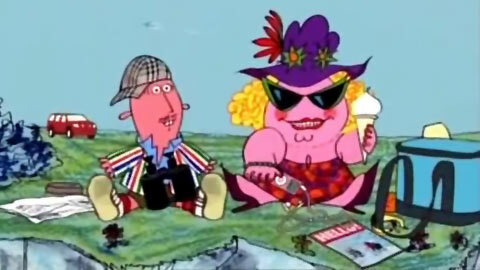 Now with a mobile-friendly update to the film that reminds us the Coastguard is only a 999-call away, starring holidaymakers, Joe & Petunia. Channel 5, Britain's newest and last terrestrial analogue TV network, was launched on Easter Sunday 1997 by The Spice Girls. This is an FAQ on the station from 1999. Everything you always ever wanted to know about PDC, the amazing invention which enabled you to set a timer to record a programme and it would still work, even if the programme was delayed. An FAQ from 2003 when analogue TV was still a thing. TV favourite Zippy from	Rainbow lets rip with a 4-letter word in the name of entertainment. Yes it's really Zippy. Don't believe it? See for yourself! Trying to get hold of an old TV theme? Here are the track listings from the TV Sets collection and This is the Return of Cult Fiction, which includes White Horses, judged to	be the best tv theme ever! Find out how you go about inventing a popular quiz show and what it's like to appear on one. A full list of contents for the pages at this web site. New and Updated pages are indicated as are those featuring audio and video clips.